I am genuinely ambivalent about the broad line of arguments we can call "the case against the DSM". I don't mean ambivalent in the modern sense ("a bit confused and unsure what to think"), I mean ambivalent in the classic psychoanalytic sense; harbouring strong feelings in both directions. On the one hand there is the interesting and essential level of critique which brings to our attention the experience of feeling labelled and the unsettling bureaucratisation of medical terminology. This line of argument I feel very positive about and engaged with. On the other there is the ever resounding echo chamber of over-confident assertions about the malign intentions of the APA and the total unusability of the DSM for research or clinical purposes. One recurring theme in the latter category is the quip that the DSM is no better than astrology. It appears in this (otherwise excellent) piece by Edward Shorter, in this interview with Richard Bentall, and in many other places besides. 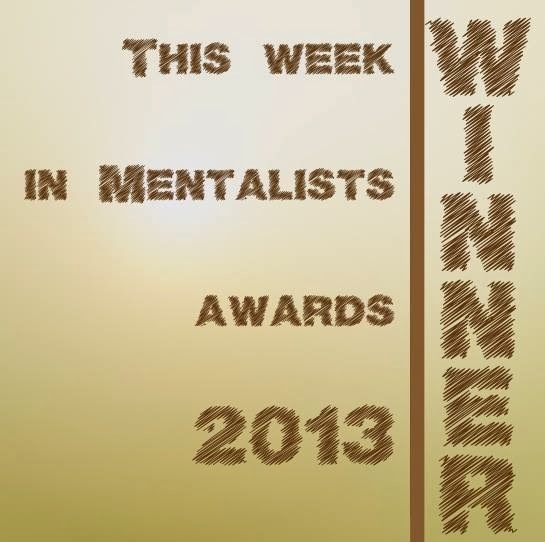 if it weren't for the fact they're very different in many ways. In the Bentall profile, the New Scientist interviewer opens by asking if comparing the DSM with astrology isn't "a bit strong". "No" says Bentall. I happen to agree with him, but not with the reasons he gives. Comparing the DSM with astrology isn't "a bit strong" (criticism of something you dislike should be strong) it's wildly off the mark. Why? 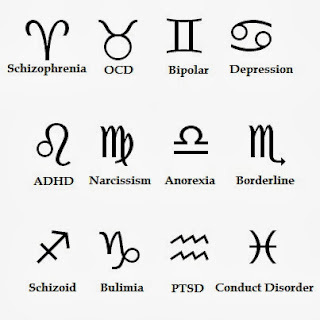 Well although you can derive some superficial comparison between the categories of the DSM and the signs of the zodiac (both describe classes of people; both aspire to some degree of reliable prediction) there are also clear differences. The most obvious and important difference is the way the way the categories are derived and assigned. 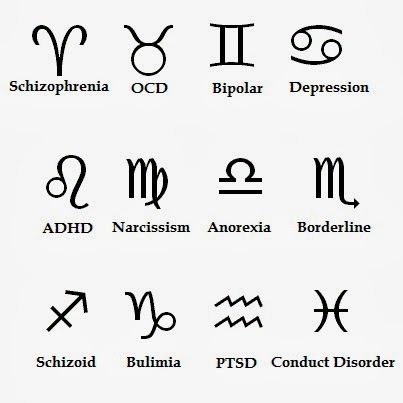 The signs of the zodiac are assigned to people on the basis of their date of birth and based upon the idea that these dates are linked to personality characteristics in a meaningful way. Meanwhile DSM diagnoses are applied on the basis of set of criteria describing patterns of behaviour. Someone designated as having, say, OCD, can be expected to resemble a particular broad set of clearly defined features. 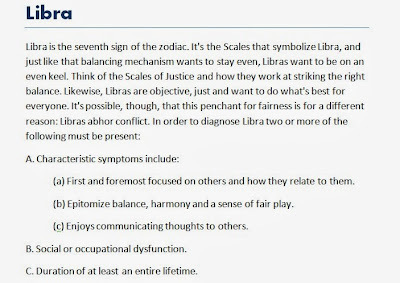 However a Libra is not just someone who is "on an even keel" (which may way not be an unreasonable classification in itself) but someone who was born between the 22nd September and 23rd October and is regarded as "on an even keel" in virtue of this fact. 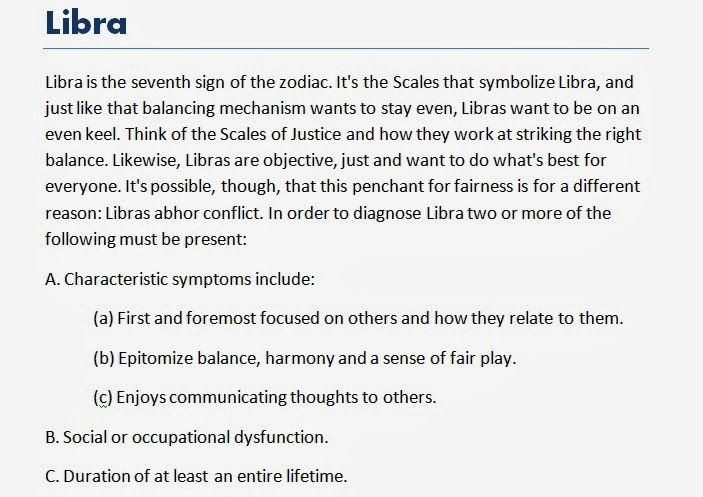 In short, astrology makes a needless jump--the linking of birth dates and personality traits--that the DSM doesn't. Why does this matter? It's not as though it puts the DSM above criticism after all. My answer is that the debate about mental health and diagnosis is very important, but if we want a serious discussion about DSM's flaws we need to accord some respect to considerations of plausibility. You can hate the very guts of the manual and its creators and still martial the strongest possible case against it. If you spin off into crowd-pleasing claims and ignore reality people will stop listening. You didn’t finish your argument.... you only liked holes in astrology, you didn’t explain why the DSM was different. Aberrant Salience and a New Meaning of "Lynchian"